The LH95 is only 24.8mm thick over the entire panel. LG has upped the ante for the high-end LED television market, releasing a 55in LED backlit television. 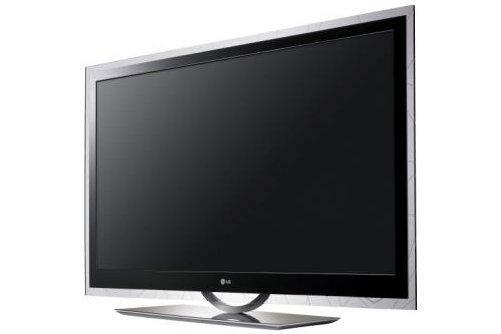 The LG LH95 boasts a contrast ratio of 5,000,000:1, which is far greater than models from competing brands. The LG LH95 reaches its incredible contrast ratio through the use of LED backlighting. It uses a sheet of LEDs at the rear of the screen's LCD panel, rather than the edge-lighting of most models from Samsung and Sony. A matrix of 3360 LEDs is divided into 200 segments with individual controls, allowing specific sections of the screen to be dimmed or brightened depending on the source material. Local dimming allows the screen to display bright white and dark black areas simultaneously, boosting visible contrast. The LH95 also features LG's 200Hz technology to smooth out motion — backlight scanning and intelligent frame insertion allows 50Hz content to be displayed smoothly. A wireless 1080p transmission system like the ones used by the Sony Bravia KDL40ZX1 and the Panasonic TH-P54Z1A allows the screen to be wall-mounted easily. Devices like game consoles and Blu-ray players can be connected discreetly to the wireless receiver. Because of this, the LG LH95 is less than an inch thick across the entire chassis. The LG LH95 LED television is available for $6499.